It is difficult for parents and providers to imagine that a child or youth they care about may be a victim of sexual exploitation. It can be extremely difficult for youth to come forward and ask for help, so knowing CSEC indicators can help you identify possible exploitation. Whenever exploitation is suspected, mandated reporters must file a report of suspected child abuse (51A) with the Department of Children & Families. The 51A report initiates a referral to SEEN and allows SEEN to communicate with the other agencies and organizations involved with a youth at risk for CSEC. If you are not a mandated reporter, you can still file a 51A, or you can contact the SEEN program directly for assistance. If you have filed a 51A, you can also alert SEEN that you have made a report by calling 617-779-2145. Filing a 51A report of suspected child trafficking or commercial sexual exploitation triggers a multi-disciplinary intervention. Even when a child is involved with multiple systems, CSEC may be overlooked or undetected. Recognizing that one system alone may not have the capacity to effectively respond to CSEC cases, SEEN convenes Multidisciplinary Teams (MDTs) to provide tailored support, streamline information-sharing, and collectively ensure youths’ needs are met, gaps in service are identified, and perpetrators are held accountable. 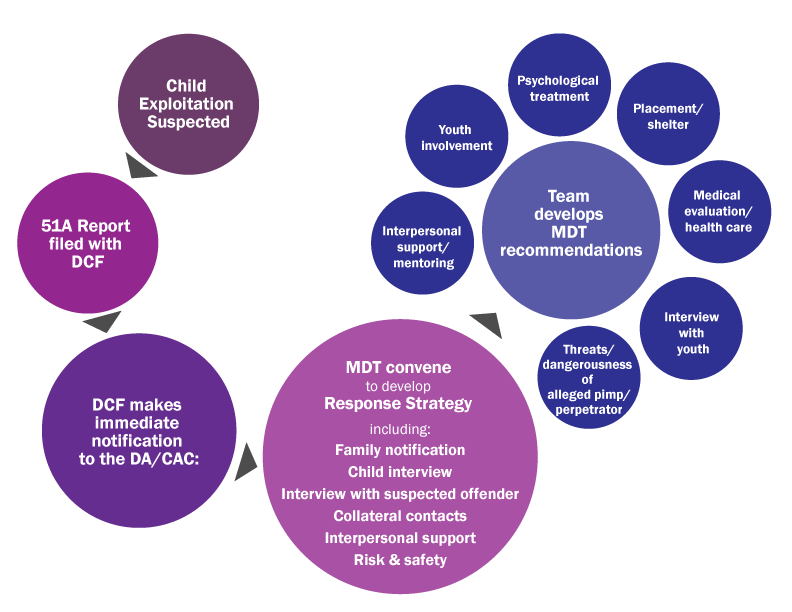 SEEN Case Coordinators contact each provider connected to the child to gather information about recent CSEC concerns, the child’s history, additional collaterals involved with the child, and to welcome new members to the MDT. Because of the complexity of some cases, we also frequently partner with other jurisdictions. CSEC MDTs are tailored to each individual. Coordinators organize MDT case conferences where members share what they know about the child’s experience of exploitation, including (if known) level of involvement, nature of recruitment, connection to the perpetrator, and where the child may be in the recovery process. SEEN Case Coordinators also facilitate ongoing communication and case planning among MDT members. The SEEN Case Coordinator coordinates a forensic interview when appropriate, and serves as the liaison between the MDT, forensic interviewer, and family to ensure the youth is well-supported throughout the interview process. SEEN also helps connect youth to a CSEC-specific network of services, working with professionals, families, and youth to identify youth needs, helpful supports, gaps in response/treatment. SEEN plays an instrumental role in planning around missing youth when CSEC is suspected. SEEN coordinate a multidisciplinary response to suspected child trafficking or CSEC from referral to support and services.